you know, if you go to the download section for maple website, it has a manual patcher for .74, right? just change the url from ending in 74 to .75 and it gives you the next manual patcher. I already did that but there still the chance they change file size or some pomegranate. Which I think screwed some people up majorly last time but i think its same problem for anyone with pre-patching. The file size is 14.6 mb. I forgot to check how large my package was at the time I downloaded it. Can someone help me confirm if the patch content got altered at any moment? You can check yourself with a hex editor. Look for an int at offset 12 (dec). If that number changed, so did the patch file contents. What inference can I make judging from this (and supposing f9 changed to another value in another ss)? It seems to me it only represents the initial letter of whatever word that follows WzPatch. don't look at "02 00 00 00". That is part of the header. Look at the int past that (Offset 12 - 15). If those numbers changed, the patch file changed. This is because those four bytes represent a checksum of the patch file. I can back that up with my programs written in python and C.
Mhm. I was looking at 0xF9, guess I was missing out on the rest of the checksum. Thanks Fiel. A new way to patch the game is now included. The topic is separated into two sections --> "For Beginners" and "For Advanced Users". The Beginners method is for using the Patch Creator, and the Advanced method is for using the Patch Reader. Nexon changed both the EU and JP links. After I downloaded the .patch file from Nexon site; edited the .bat file then save. I run the .bat file but nothing happened. "This application has failed to start because the application configuration is incorrect. Reinstalling the program may fix the problem"
What is my problem here? Do I have to install .Net Framework or something else? EDIT: Updated the download link. Try the newest download. That one should work. Not trying to be a bother every patch but it's not working this time, Fiel. Perhaps they changed something again? Last edited by Kalovale; 2009-11-11 at 05:43 AM. idk about you guys, but i cant see the files of patch 0.79, i can see until patch 0.77... Nexon changed something? 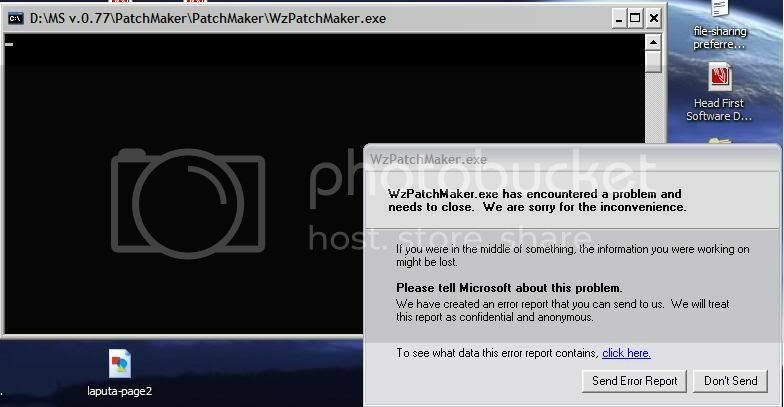 I've integrated the WzPatchMaker source with my PatchReader source, so you can create a manual patcher and manually read through the patch file with the same program. I've also updated the links so that they download from Southperry directly instead of using sendspace - no more downloads not working. It's faster when I say it this way too. - New Feature: Patch EXE hijacking. - Rebranded the program to be called "NXPatcher" instead of "Patcher.exe"